Slowing passing through the gate, Carl sees someone in the window of one of the houses. A noise startles them, but Daryl finds that he only snagged an opossum. The gate closes behind them, and they are asked to hand over their weapons. Aaron suggests that they talk to Deanna. Rick spots a walker just beyond the gate on the outside and has Sasha take it out. Deanna introduces herself to Rick and asks if she can film their talk. She explains that they are about transparency in their community. As Deanna starts to ask questions, she introduces herself as a former congresswoman from Ohio. The community was a sustainability project, full of features to take advantage of their resources. Rick is skeptical about the community and Deanna’s intentions, while she appears to believe that Rick and his group are good people. She continues to try to recruit them to join because of his ability to survive and help her community survive. She challenges him to make a decision. He admits that he used to be a sheriff and cracks a small smirk at Deanna. 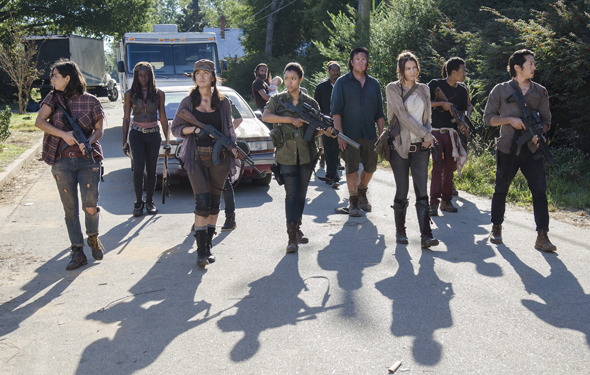 Turning in all of their weapons, Rick’s group learns that they are allowed to get their guns at any time they leave the community. Aaron takes Rick and Carl over to choose a house and leaves them to explore the houses and the rest of the community. Inside, Rick and Carl discover that the house has running water. After taking a shower, Rick decides to shave off the beard. A knocking interrupts his clean up. Jessie brings over some supplies and offers to give Rick a haircut. She starts to talk about her sons, Ron and Sam, and offers to introduce them to Rick and Carl. Rick admits that he is overwhelmed by all of the amenities. Daryl takes his turn at the interrogation with Deanna. He admits that Rick and Carl deserve a roof over their heads. Carl and Carol take a walk through another house and then meet up with Rick and Daryl. They agree that they should all stay in the same house for the night. Carl, still in the house, hears a noise upstairs and goes to investigate. He finds nothing but comic books and other random items. That night, everyone sets up in the living room. Michonne is excited about the long cleanup and admits that he should trust their opportunity. Deanna stops by and is glad to see the group staying together. She admits that she is figuring out everyone’s jobs. While the group lays down to rest, Rick is restless and goes to the kitchen, grabbing a knife out of the drawer. Michonne takes her turn in front of the camera and admits that she and the others are ready for this opportunity. 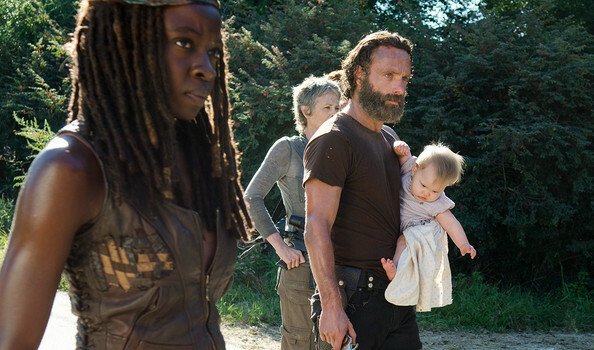 Rick decides to take Carl and Judith out to explore, but Daryl stays back. Rick realizes that they rest of the group has already gone ahead, and it makes him nervous. He runs into Jessie and she shows him where to find Carl and Judith. Carl gets a chance to meet Ron, Michael, and Enid. While offering to play video games and pool, he is take aback by the offers. Later on, Carl has a chance to meet with Deanna as well. He talks about the incident with his mom during childhood. Back with Rick, Carl is still questioning the community, but he is concerned about the people being weak. Later that night, Michonne catches Rick awake watching out the window. They talk about committing to this opportunity, but they both admit they are concerned about something. Out on a walk, Rick runs into Jessie’s husband, who appears to be a little standoffish. Carol gets her chance to interview and talks about her life before the fall. She feels like she became something like a den mother. Unsure of where she might fit in, she leaves the conversation a little open. With Daryl, she yells at him to take a shower and try to open up. Glenn’s interview expresses concern for wanting to make it work. Outside of the gate, Rick walks the perimeter. He finds a single walker stumbling out of a barn, but does not see a second one in the distance. Walking away, he goes to the place where he hid the gun and finds that it is gone. Back inside the community, Carl catches Enid sneaking around the fence and creating her own ladder to climb over. Carl goes to follow her and finds her running out into the woods. Carl meets up with Rick and they fight off the small herd with their knives and scrap metal. Glenn, Tara, and Noah meet a couple of the guys and agree to go on a supply run. They learn about the community’s efforts to gather supplies, but they are also surprised to find that they have a walker strung up as a reminder to the people they had lost previously. The walker escapes and nearly kills Tara before Glenn kills it. This erupts into an argument back at the gate, with Glenn decking out Aiden (Deanna’s son) and Daryl tackling Nicholas. After tensions flare, Deanna commands attention and officially welcomes Rick’s group into the family. She also officially offers Rick and Michonne the constable positions. While Daryl is still uneasy and walks off, he, Carol, and Rick talk later that night and confirm that their guards are still up. Reaction: Rick finally got a taste of his own medicine with that interrogation. As the group is now in a place that seemingly is absent of terror or trouble, trust has emerged once again as the theme of the hour. Throughout this episode, everything set itself up to both concern the group with the power they were giving up and encourage them for the opportunity for comfort. Both Carl and Carol express concerns about the group getting weak if they settle in. At the same time, they took full advantage of taking showers, cleaning themselves up, and sleeping in a comfortable, safe environment…that is, all except for Daryl. Since the fall, they have lived without most amenities except when they had their community at the prison. There is an interest to finally find safety. It is somewhat crazy to see the comics unfolding on-screen now. The entry into Alexandria was eerily similar to the graphic novel. One of the most significant differences though was the placement of Deanna as the leader of the community rather than Douglas. Their personalities seem relatively close for the time being, but that could quickly change. In comparison, Jessie and her husband were introduced in just the same way as the comics and the group sleeping in one house also played out the same. With Daryl still as a major wildcard, it will be interesting to see how Alexandria continues to unfold. Will certain group members still be in trouble in the near future? Will the peace shatter with the contrast of the community and Rick’s group? Will they find other survivors outside of the walls?